Which is what either Donald Fagen or Walter Becker said to the other at some point in their pre-Dan days because – if you never knew – that’s exactly what they’re named after. I never thought I would grow up to become a Steely Dan fan. Sure, like most (I think) in Jr. High/High school during the late eighties/early nineties I went through a musical discovery phase wherein I slowly acquired favorites and jumping-off points via the local classic rock station (Joe Thomas and 105.9 FM, WCKG reprasent!!!) but Steely Dan was never really a draw for me. Sure, I liked a few tunes in the same way I liked almost everything else they played on that station at that time, then I cordoned off the little corner of the classic rock universe that was the most important to me (Zep, Bowie and the Stones* basically) and pretty much ignored or started making fun of everything else as a late-teens/early 20’s; My friend Sonny and I would mention Steely Dan in joke routines that revolved around the middle-aged, perpetual rocker. You know, the guy that thinks rock should have stopped in ’78 because Steppenwolf perfected it. The fact is though, all my friends and I have grown up and re-discovered that some of that ‘vanilla’ stuff isn’t quite so vanilla – you either need an older perspective on it or we can in some instances blame radio because of course in most cases one song is simply not enough to unlock the brilliance of an album or a band. What’s more I’ve found radio can actually do harm, as in the case with Tool’s ‘Schism‘ finding every available speaker to play from in 2000 and nearly ruining my continued unbroken contemplation of Lateralus as an Album. 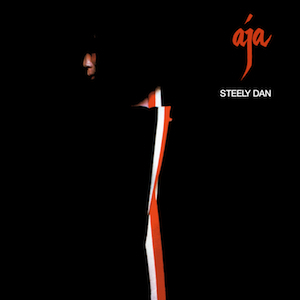 That aside, about two years ago I discovered the inherent magic of Steely Dan’s Aja. Admittedly this had been building. The bar in Chicago where I spent most of my nights after work was a small, older guys’ place that had a somewhat limited jukebox and the best goddamn bartender I’ve ever met. I’d go in late at night and have a few, talk with the locals and the bartender, and usually throw some money in the box. Being that we’d been going there off and on for years (I believe Mr. Brown had found it circa age 21) my friends and I had all learned to navigate to what we liked or could settle for in that box and Aja‘s opening track, ‘Black Cow’, was often included in that playlist after I’d heard the bartender play it enough times. It’s a swanky little number, kinda white-bread jazz but funky just the same, and the overall elegance of the track won me over in time. Now fast forward four or five years – by the time ‘Black Cow’ had fallen into my swoon category I’d moved and, at some point acquired Aja on vinyl. Thrift store maybe? Anyway, last year at some point I discovered the rest of the album, specifically side one closer ‘Deacon Blues’, which is a smooth, laid back track that owes as much to intoxication as it does to skillful musicianship. This is a number from the 70’s about the 70’s; about style in the casual, laid-back quaalude atmosphere of the days directly preceding Reaganomics and AIDS. What’s more there is a certain tone that smothers this album and it’s what I’ve come to call 2AM. It’ll be hard to explain 2AM in so brief a setting as a blog about something else entirely, but if you know Steely Dan chances are you already know what I’m talking about. Suffice it to say that 2AM is a time, but it is also a place; a state of mind. After working in a lounge and living in the lounge culture for five years this became a very important color in my palette as a writer and Steely Dan’s Aja compliments this color nicely with its smooth feel and fuzzy tales of broken hearts, drunken debauchery and cool-as-ice anti-heroes. * I really do not consider David Bowie, at any point in his career, classic rock, but he does fall into that category here for the purposes of discussion. Classic rock, to me, implies the band either ended or has all but ceased to end. Zeppelin obviously ended on September 25th 1980 after Bonham’s death (although I do consider their final album Coda canon and a veritable masterpiece) and The Stones, as much as I LOVE them, should have ended sometime in the early 80’s. Bowie has continued to grow and evolve and in fact, in my opinion his 2005 album Reality is his best album (no hate towards the others intended). Reality sounds like nothing else he or anyone else has done. I guess this evolution makes him, in my mind, sort of the first New Wave artist.